"Group Captain Leonard Cheshire VC, DSO**, DFC* & Wing Commander Roderick Learoyd VC"
Leonard Cheshire, holder of the Victoria Cross and the RAF’s most highly decorated flyer in WWII, is joined by another recipient of Britain’s highest award for gallantry, Roderick Learoyd. Both bomber pilots were aware of the enormous responsibility they carried with their crews’ lives depending on their skill, and both rose continually to the challenge. Leonard Cheshire was awarded the Victoria Cross in 1944 for four and a half years of sustained bravery during a total of 100 bomber operations. His final and possibly most momentous was as the official British witness on board the aircraft that dropped the atom bomb on Nagasaki on 9 August, 1945. Rod Learoyd was awarded the Victoria Cross for his part in the low-level night attack on the lock gates of the Dortmund-Ems canal on 12 August, 1940. He somehow got his badly damaged Hampden and its crew back to Scampton without loss of life. 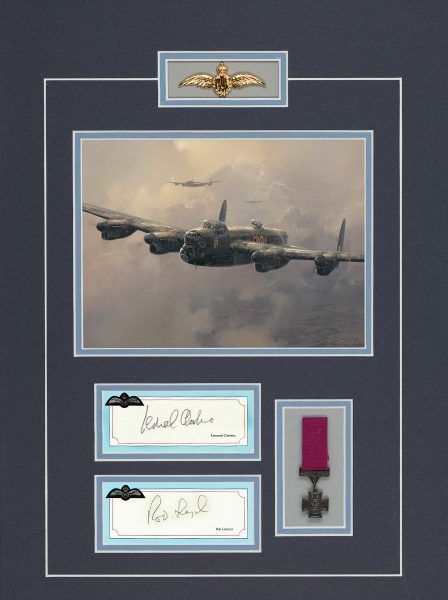 To represent one of the RAF gallantry decorations each one of these pilots received during World War Two, a miniature replica Victoria Cross medal has been expertly mounted into the display.